Us Southern Hemisphere folk enjoy a Christmas of golden beaches, summer sun and sausages on the bar-B. Northern Hemisphereians - not so lucky - get snow to shovel, colds and face-stinging winds. Now though, they can indulge their inner sci-fi fan and kick Jack Frost in the balls, with a hand-knitted Alien Facehugger, perfect for icy temperatures! Available for a wallet friendly $150 from Etsy seller, Knitrocious, if you replace the annual family festive sweater with this handy garment, you'll have a memorable family portrait, perfect for any mantle! that has got to be one of the coolest things you've ever blogged about. Glad you like that one Dave. I wonder if it sells well, if she'll also come out with a Starro version? Whoa! Now that's some seriously missplaced love right there, ha ha. Can you imagine grandma getting that for christmas? Maybe Grandma Morbid would love it, but anyone else would be "Dafaq is this?" How to know when Nan secretly hates you. You unwrap a knitted face mask of an acid dripping alien! Gee Nan, are you trying to tell us something? 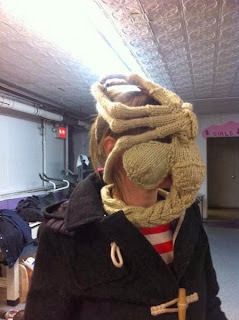 And is there any way you can knit up some Predator dreads while you're thinking? Yes, but hand-knitted complimentary skull and spinal column will make any Predator costume complete!